Last week, we discussed ambivalent sexism, and I described the difference between Hostile Sexism and Benevolent Sexism. This week, we discuss how benevolent sexism serves to undermine gender equality. Becker and Wright (2011) argue that benevolent sexism and hostile sexism have distinctly different outcomes. Most folks know hostile sexism when they see it, and it typically insights anger and action from people. Benevolent sexism, on the other hand, enforces the same beliefs, but reduces the likelihood for action or activism to occur. To be more precise, Becker and Wright (2011) are referring to collective action, not just anger. When we are motivated to resolve something for our individual benefit, we might be referring to individual mobility. Collective action takes place when one fights for the sake of their entire group – not just themselves! Imagine this scenario – a man and woman are discussing the World Cup. The second woman is attempting to improve equality across the board, not just raise herself above her own group. The individual mobility of the first woman can seem quite subversive as it reinforces the a stereotype while attempting to improve one’s own standing. According to Becker and Wright (2011), benevolent sexism accomplishes three things to lead to a decrease in collective action – gender-specific system justification, perceived advantages of being a woman, and positive affect. In the figure below, note how the increase in factors leads to collective action. Compare this to hostile sexism, where the negative affect serves to moderate the collective action (increasing its likelihood in this case). 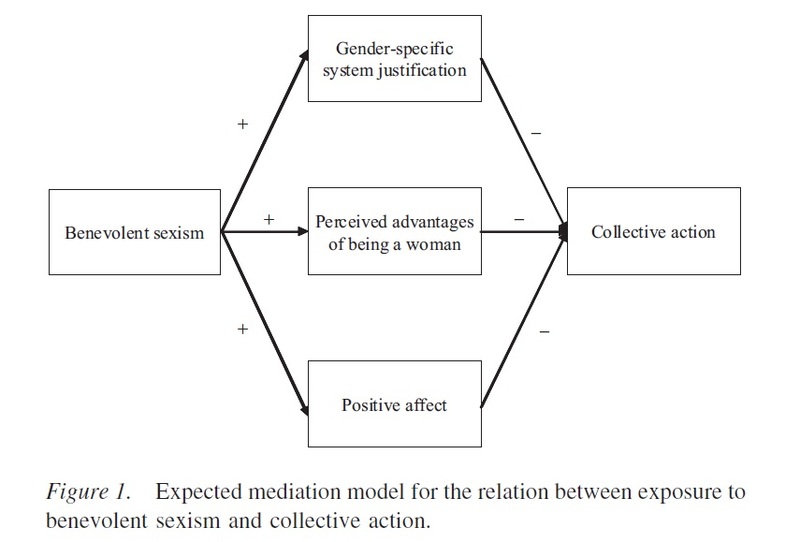 To be more clear, while the gender-specific system justification and perceived advantages of being a woman still reduce likelihood of collective action with hostile sexism, but the negative affect moderates the outcome by changing the magnitude and direction of the effect (changing a decrease into a large increase of collective action)! Becker and Wright put their idea to the test in a series of four experiments. The first study tasked participants to read a series of short passages that had one of four types of statements. These statements either contained (1) benevolent sexism, (2) hostile sexism, (3) non-sexist statements supportive of women, or (4) statements that had no remarks regarding gender. The authors included the third variation to see if supportive comments also led to a reduction in collective action, as their model suggests positive affect was a major moderating force. After reading the passages, the participants answered questions relating to gender-specific system justification, advantages of being a woman, positive or negative affect, and likelihood to take collective action. First, the authors did not see a significant difference between the non-sexist positive statements and the non-gender comments. As these groups were statistically identical, the results were pooled and treated as the control group. 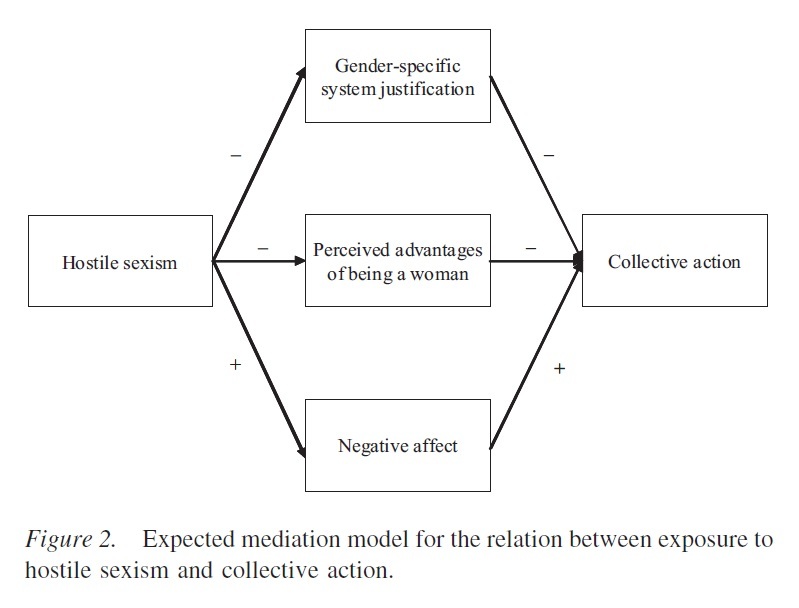 As shown in figure 3, the benevolent sexism group had the lowest likelihood to engage in collective action after reviewing their short passages. Becker and Wright (2011) go on to say this is the first evidence showing that the type of sexism moderates likelihood of collective action. Compared to the control group, the hostile sexism group has increased likelihood of action, and the benevolent sexism group has a decreased likelihood of action. The authors wanted to replicate their findings, but they also wanted to provide a bit more face validity. The experimenters used the same four sets of statements from the last experiment, but overall the design was much different. Participants came to the experiment site (a room at a university), and each participants did the study separately. Participants received an envelope containing 6 statements, just like in the first study. Experimenters were blind to which students received which items. The participants we taken to a second testing room for a “memory test” on the 6 statements they had read, but had to wait outside for 5 minutes. Participants could sign the petitions and take any number of fliers to support each cause. The fliers would be delivered to the student at a later date, so participants wouldn’t need to worry about carrying them at this time. Experimenters assumed more fliers and rate of signing a petition would be moderated by the statements the participants read. 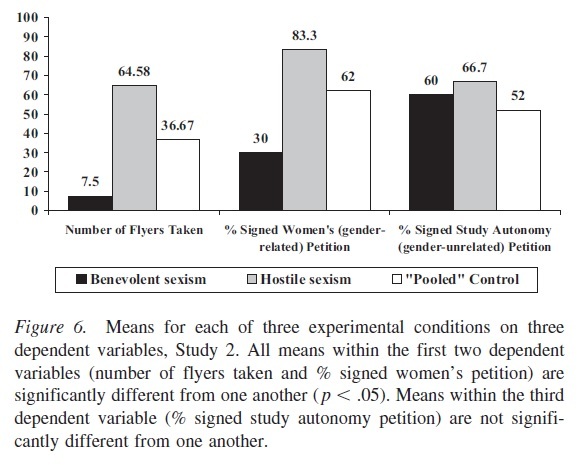 Participants in the hostile sexism group requested more flyers on average than any other condition, and the benevolent sexism group requested fewer fliers than both the control, and hostile condition. As we saw in study 1, we certainly see how requesting fewer fliers would be expected as those exposed to benevolent sexism are less likely to take steps towards collective action. We see the same relationship in frequency of petition signing. More participants exposed to hostile sexism were likely to sign the gender-related petition than other groups, and the benevolent sexism group was least likely to sign the gender-related petition. For the last student autonomy petition, we see no statistically significant difference between the groups. According to Becker and Wright (2011), the participants were not expected to show a difference in the student autonomy petition as they were all equally part of the same in-group. That is to say, the participants were not comparing men versus women any more, or even students versus faculty. However, the students are still endorsing collective action for students, but the benevolent sexism group only commit to collective action for students. This distinction is vital because the authors were able to show that you can decrease collective action in specific contexts but leave it untouched for others. We might even assume the student autonomy question shows the participants baseline for collective action, but that might be too strong of an assumption. Study three tasked participants with an online survey. Participants were shown one of two version of the same paragraph, and they were either in the high or low gender-specific justification group. The paragraph stated most students felt the distribution of societal resources between men and women was fair (high justification), or that most people felt it was unfair (low justification). See the excerpt from Becker and Wright’s (2011) selected passage in the figure below. The values in parenthesis show the difference between the high and low justification groups. After reading the statements, respondents rated their agreement to a gender-specific system justification statements, and collective action statements. Respondents who were exposed to higher levels of gender-specific justification in their paragraphs were more likely to endorse gender-specific justification statements. Additionally, the high justification group had lower intentions of collective action than the low justification group. Becker and Wright (2011) went on to replicate study three with one minor change. Instead of using a passage about gender-specific justification, the passage described different levels of perceived advantages of being a woman. Once again, one group was exposed to high levels of perceived advantage, while the other group was exposed to low levels of perceived advantage. The study’s conclusion was identical to study 3 – exposure to benevolent sexism led to a reduction in collective action. To be more precise, those exposed to high levels of perceived advantages of being a woman were the least likely to show intent of collective action, while the low perceived advantage group was more likely to show intent of collective action. Becker and Wright’s (2011) research showed us how damaging benevolent sexism can be. While it serves to enforce social norms and stereotypes just as hostile sexism, it also leads to a decrease in collective action. Further, their research shows both perceived advantages of being a woman, and gender-specific justification by themselves are enough to reduce collective action. The study did not include research on paternalism, however I believe the behavior would produce the same output. I know we dove into the research pretty deep that time! I think it’s clear what happens when we engage in benevolent sexist actions. Just like last week, I think we need to be mindful of the sources of our behavior. Am I acting a certain way because of someone’s gender, or am I acting a particular way to be as supportive as I can regardless of gender? If we continue to enforce gender-specific roles, act paternally to those we claim to respect as equals, and place people on pedestals, we will essentially be disarming those whom we claim to care about the most. In conclusion, take responsibility for your attitudes and actions, but I know slip-ups still happen. Just be sure what you say and do is what you believe, not what you were simply trained to think! Becker, J. C., & Wright, S. C. (2011, February 28). Yet Another Dark Side of Chivalry: Benevolent Sexism Undermines and Hostile Sexism Motivates Collective Action for Social Change. Journal of Personality and Social Psychology. By psychddouglas in Uncategorized on July 11, 2014 .